Samsung's virtual reality ecosystem expands with this consumer-ready camera that makes it easy to capture 360 photos and video. It's best in the hands of Gear VR-owning creative types, though, it's not quite as pocketable as its closest rival, or waterproof. Update: There's a new Samsung Gear 360 (2017) available, so be sure to check out our full review. Seeing the Samsung Gear 360 in person immediately reminded me of my Logitech webcam from the 90s, but it's actually the most cutting-edge VR capture technology for consumers distilled into a tiny ball. With a press of a button, I was able to build my own virtual reality world at MWC 2016, thanks to its dual fisheye lenses that stitch together 360 video and capture 30MP still photos. It's was easy as that. The Samsung Gear 360 isn't the only consumer-grade VR capturing camera I tested at MWC. The LG 360 Cam, also announced in February in Barcelona, has the same wide angle ambitions. But Samsung's got the advantage: it has a popular virtual reality headset on the heads of its Galaxy phone users right now, and it has that important Facebook partnership for content. All of this goes to fuel the Samsung Gear VR headset as the de facto method of experiencing virtual reality without having to spend a fortune on Oculus Rift, HTC Vive or forthcoming PlayStation VR. The official Samsung Gear 360 release date in the US is still an unknown, but the VR camera did launch in its home territory of South Korea on April 29 for 399,000 won (about $340). The UK also has its Samsung Gear 360 price locked down at £299 (about $430, AU$587), but the actual release date remains a mystery. How much will the Samsung Gear 360 cost in the US? Based on exchange rates and competition, it'll likely fall between $350 and $400. That seems expensive for a tennis ball-sized camera, but then again, the Gear 360 has two lenses and is able to capture everything around you in 4K. Early adopters will surely pay that price. The spherical Samsung Gear 360 is built to be palmable and lightweight for on-the-go filming, meaning you'll be able to tote it around the world and capture your travels in 360 degrees. This isn't heavy-duty equipment anymore, measuring 66.7 x 56.2 x 60 mm - slightly smaller than the size of a baseball - and having a weight of 153g when the battery is included. Neither is the mini, easy-to-connect tripod. It uses the standard camera 1/4 inch thread, meaning it can be taken off and replaced with a full-sized tripod. Camera controls are built right into the Gear 360, even though there are also ways to record in the app. That's convenient for fast recording reflexes without diving into your phone. Sitting right at the top is a giant red record button, and it's adjacent to a small .05-inch PMOLED display. You won't have to clutch the phone all of the time to know your recording status. Around the side is a Bluetooth button for connecting the Samsung Gear 360 to new devices and a Back button for navigating through the Gear 360 app's menus. On the other side, where the camera is emblazoned with the Samsung logo, there's a tiny door that shields the microSD card slot, micro USB port and removable battery. Yes, this is one Samsung device that supports both microSD cards and swappable batteries. Everything around the glass fisheye lenses is made of plastic, unlike the Samsung Galaxy S7 you are going to pair it with, but it should remain durable enough. 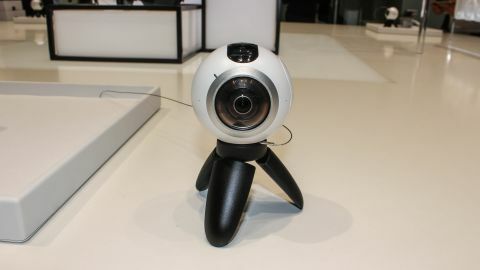 Samsung says that its 360 camera can be slipped into a bag, but the bulbous design could be an issue for smaller totes. It just isn't as sleek and pocketable as the LG 360 Cam. The Samsung Gear 360 isn't waterproof either, but it is certified for IP53 protection. That means it can withstand dust and water droplets, but it's short of IP68. It's not ready to go for a swim. This is where the Samsung Gear 360 is going to be virtual-world changing. It sticks two 15MP cameras back-to-back for high resolution 360 video capture at 3840 x 1920. Your spinning world doesn't always have to be moving, of course. The camera's dual lens setup also captures still 30MP photos that create panoramic images at 7776 x 3888. The day you own a Gear 360 is the day you stop painstakingly panning your phone from left to right for a panorama and get shouted at for not going slowly enough. This does it all in a snap. Halving the video and photo is also possible by turning off one of the lenses for 180-degree wide angle video and images using only one of the camera lens. Trust me, it's still incredibly wide. Everything that came out in my tests was properly lit and in focus. This is Samsung making use of its Bright Lens 2.0 aperture that's always supposed to be ready for low-light conditions. What I couldn't see were the sealed-up internals: a DRIMe5s image processor, 1GB of RAM and, accelerometer and gyro sensors. The 1350mAh battery is thankfully removable through the aforementioned trap door. Everything the Samsung Gear 360 camera soaked up around me was transported to my face instantly, even if I moved away from where the recording had happened. Even more surreal was seeing the live results of both videos and photos stitched together in real time on the Samsung Galaxy S7 phone I was using. I could even swipe around the screen to see behind me. The Gear 360 app has more video recording options beyond what you'll get by tapping that big red record button. Besides 360 degree video and photos there are time lapse and looping video modes to bring VR into the more powerful camera world. Everything this Samsung camera records is output in MP4 (H.265) for video and JPEG format for still videos, so it's easily transferable to your phone, computer, Facebook and YouTube. You don't have to own a Samsung Galaxy S7 or Galaxy S7 Edge to use the Gear 360. It is also compatible with the Galaxy S6, S6 Edge, S6 Edge+ and Note 5. All of these phones can run the required Samsung Gear 360 Manager app, and there's a PC software equivalent called the Gear 360 Action Director. The Samsung Gear 360 is a palmable VR camera that works best in the hands of early adopters who consider themselves creative types. The Samsung Gear VR's pre-installed 360 degree photos section does an excellent job at introduction new users to an immersive world, and soon, those same users can graduate to capturing their own 360 degree photo and video content. Samsung has the right technology to back it all up. The company's world-class mobile camera technology transitions to this standalone dual 15MP camera setup, and the results are surreal. Its body is bigger than the LG 360 Cam, so I won't be shoving this bulk camera into my jeans pocket without getting stranger than normal looks, and this version isn't ready for my underwater snorkeling shots. It's a bit too delicate at this stage. Samsung Gear 360 needs to launch at the right price in the US and move beyond its vague promise of a release date in Q2 2016 in the US and UK. Once that happens, it could easily become the de facto VR capture camera for consumers, just like the Samsung Gear VR is doing right now as an affordable headset.